Lock in a great price for Hotel Indigo Athens - University Area – rated 9 by recent guests! Julian at front desk was very helpful and extremely clean !!! This is a superb hotel with excellent facilities.It is a green hotel and an incredible operation. The room was large, clean, and had a great corner view. I didn't eat breakfast but we drank some wine the night we stayed. The whole vibe here was very cool. Nice property - clean rooms and easy access to parking. Hotel Staff very helpful, room was very clean and very modern. Best hotel I have stayed at in a very long time! I went for UGA Parent Orientation and would have much rather spent my time in my beautiful room. Hotel Room Service was great, food awesome! Everyone very professional. We had a king suite that was clean and nicely decorated. We weren't able to get a hold of room service late at night (the front desk attendant took a restroom break) but the officer on location at the front desk was able to help us with a small request for a bottle opener. The staff was all very helpful at checkin and also helped us with our bags getting into the room. Would certainly recommend this property. Very hip and stylish. Walk to restaurants and campus. Hotel Indigo Athens - University Area This rating is a reflection of how the property compares to the industry standard when it comes to price, facilities and services available. It's based on a self-evaluation by the property. Use this rating to help choose your stay! Located in the Downtown Historic District of Athens, Georgia, this hotel is a 5-minute walk from the University of Georgia. It offers on-site dining, a 24-hour gym, and free Wi-Fi. Each of the modern and colorful rooms at the Athens University Area Hotel Indigo include hardwood flooring. 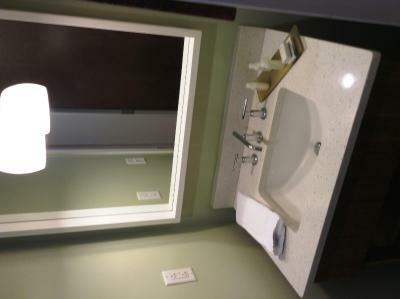 The spacious bathrooms are furnished with a glass-enclosed walk-in shower. Guests can watch cable TV or play music on the Cubie Blue. This Athens hotel offers concierge services and has an art display that changes seasonally. A business center is located off of the lobby. The on-site Madison Bar serves gourmet meals for breakfast and dinner. It offers a full-service bar and outdoor seating. The Athens Country Club is a 10-minute drive from Hotel Indigo Athens University Area. 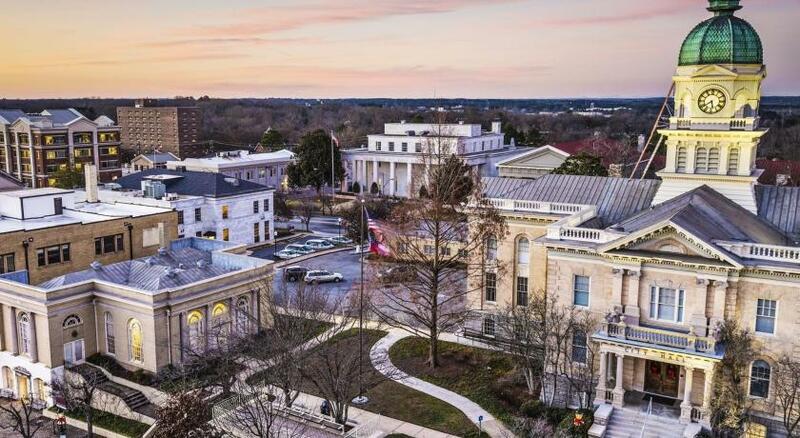 The Georgia Museum of Art is 2 miles from the hotel. When would you like to stay at Hotel Indigo Athens - University Area? This room features expansive windows, flat-screen cable TV, and a desk. 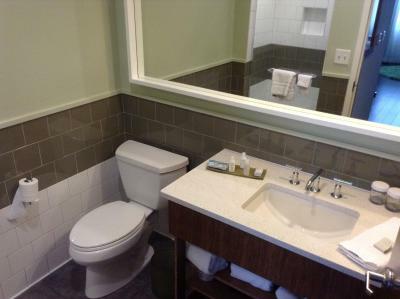 This wheelchair accessible room includes a roll-in shower and grab bars. 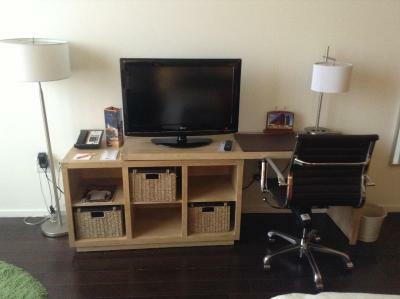 This room features expansive windows, a flat-screen cable TV, and a desk. Located on a private floor with free beverage station. Features wall-to-wall windows and elevated ceilings. This spacious suite features a separate living area and 2 flat-screen TVs. This spacious suite features a separate living area and 2 flat-screen TVs. 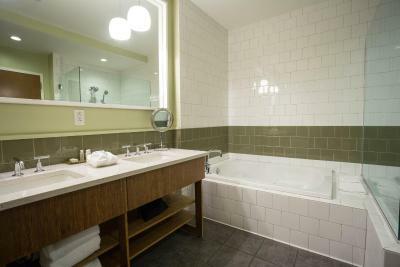 Bathroom features a whirlpool tub. This spacious suite features a separate living area, 2 flat-screen TVs, and city views. House Rules Hotel Indigo Athens - University Area takes special requests – add in the next step! Hotel Indigo Athens - University Area accepts these cards and reserves the right to temporarily hold an amount prior to arrival. The staff , bed pillows,and bar ! TV was ridiculous. No buffet breakfast. No work area in room. Had to pay for coffee on the way out each morning. Staff couldn't help me resolve billing issue. furnishings were poor quality. cheap. You have to pay for coffee in the lobby. Most hotels offer this complimentary. I can't think of anything. We only live one hour from Athens. To treat ourselves after a long illness, we decided to spend the night and see some fun stuff, The Indigo was great. Close to downtown but far enough away to be quiet for sleep. We've stayed "in town" before and the traffic/rowdies are no fun at 2 am.